So yesterday, I sort of stepped on some of your toes, but today, I’m stepping on my own toes. Because I’ve really been struggling with getting dressed in the morning. In fact, to be 100% honest, I’ve worn my workout clothes almost all day everyday this week and I only got a few showers in. Ick, I know, but I’m just being truthful here. If you just were utterly horrified with me, you have every right to be. Because it’s not how I want to be living either. Nor is it the kind of example I want to be setting for my kids. Yes, I could make the excuse that we started our new homeschooling schedule and P90X this week, but those are just that — excuses. The real reason I’ve been struggling with getting dressed in the morning lies in the fact that I’m not making it a priority. My days are full, no doubt, but I find time to blog and I find time to read. So that means I could also find time to shower and get dressed in something other than workout clothes! Instead, it seems that this past week I’ve been having my morning quiet time, heading downstairs to exercise with my husband, and then I get busy with taking care of my children’s needs, homeschooling, cleaning, cooking, blogging and all the other things that fill up my day — and all of a sudden, it’s almost dinner time and I’m still in my workout clothes. I know that when I take a shower and get dressed in something that makes me feel great, including hair and makeup, I feel so much better about myself, I’m able to head out the door at a moment’s notice, I don’t fear the doorbell ringing (! ), and I seem to be more productive, too. But knowing these things is not enough, I need to crack down and actually do something about it. So today, instead of sharing with you some tips and practical ideas like I’ve done every day in this series so far, I’m coming to you for help: What advice and tips do you have for someone like me who struggles to get a shower in and get dressed every morning if I’m not going anywhere that day? I’ll share my plan of action for how I’m going to seek to improve in this area on Monday. Bedtime: I made it to bed by 10 p.m. last night — 30 minutes after my bedtime. Hopefully, I’ll do better next week! Wake Up Time: 5:20 a.m. Okay, I’m probably going to step on some toes here, but I want to stick my neck out anyway and say this: As long as you continue to say “I’m not a morning person” you never will be one. We’re all wired differently. Some of us are better at getting up in the morning. For others, it’s a big struggle. But when you convince yourself that you’re just not a morning person, you’re basically committing yourself to failure before you even try. You might not be able to get up really early. You might not jump out of bed ready to hit the ground running. You might require more hours of sleep than other people. But don’t let those things keep you from trying or seeking to improve. If I were to declare “I’m not good with money,” that might be true. But that doesn’t mean the fact that I’ve handled money unwisely in the past needs to define me or be used as an excuse for blowing money on things I don’t need or racking up credit card debt. Having low expectations of ourselves is one sure way to never rise above the status quo. It’s also sure way to live a mediocre, boring life. So, no matter what you’ve done or been in the past, don’t let that define you. Instead, start taking steps toward where you hope to be. And keep at it, even when the going is rough. I didn’t consider myself a morning person for year and years. I’m still a bit of a morning person-in-training. However, I just wanted to chime in and say that I didn’t know I had potential to be a morning person until I committed to trying it for three weeks. I hated it – truly hated it – for the first week. By the 2nd week, I didn’t mind getting up quite so much. 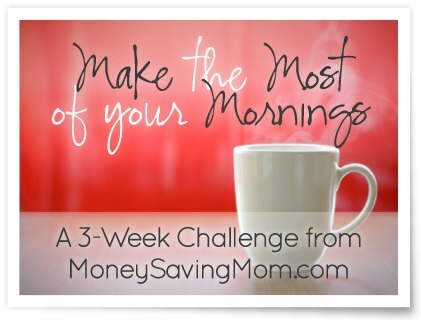 By the 3rd week, I found that I really looked forward to my quiet time to myself! Don’t get me wrong, I’m not saying that if you start getting up early every morning you’re going to magically turn into someone who loves getting up at the crack of dawn. Nor am I saying that everyone should get up really early. What I am asking is that you stop and consider whether your preconceived notions about being a certain kind of person are holding you back from success. Bedtime: Um, so much for getting to bed by 9:30 p.m. But hey, after my shopping fiasco, I did at least make it to bed by 10:30. Wake Up Time: 6:30 a.m.: It felt so late, after four much earlier mornings. And I felt behind all day. At least I know that the early morning wake up times are making a big difference. Now if I can just stick with them…! 4. Consider whether you have preconceived notions about yourself that might be holding you back from success. Exercise is often one of the thing that tends to get pushed to the back burner when schedules are busy, but starting the day with a little exercise is one of the best ways to wake you up and make you feel energized for the rest of the day. If you’re dragging along and feeling like you’re lacking energy and enthusiasm for life, exercise just might be the best antidote. I know it’s not the most exciting things to get up and do in the morning, but exercise is one of those things that you never regret doing. Instead of making excuses as to why you can’t find time to exercise, start thinking of ways to you can fit some exercise into your morning. Your health is worth the sacrifice of a little time, sweat, and effort. And I promise you’ll feel better the rest of the day! If you can’t afford to pay for a gym membership or a trainer, check out the workout DVDs at your local library. Typically, they have quite a large selection to choose from. Some of my favorites are by Jillian Michaels (more intense workouts) and Leslie Sansone (these are great for beginners or those looking for low impact exercise). I’ve found exercise DVDs are a great way to mix things up — especially if my current routine seems like it’s becoming a bit mundane. And it’s a lot less inhibiting to work out in your basement or living room, rather than in a group of people at a class at the gym! Can’t make it to the library? The internet is goldmine of exercising videos and resources. YouTube is a great place to start if you’re looking workout videos. Also, some of my readers left other online resources on my Facebook post here this morning. If you don’t enjoy exercising, it’s probably just because you’ve not yet tried enough different kinds of exercise options. There’s pretty much something out there for everyone, so keep trying things until you land upon something you love. Teaming up with someone else can be a great way to be more successful when it comes to fitness. Either find someone to meet you for a morning jog, to come over and do that exercise DVD with you multiple times per week, or find someone who will text or email you and see if you followed through with the goals you set for exercise each day. There are also many different online accountability forums and Facebook groups (or you could start your own!). So set some fitness goals and then figure out what tiny steps you can take this week to help you get where you want to be in six months from now. It’s amazing how motivating the act of putting your goals on paper and breaking them down into small pieces can be. You can do this — one step at a time! If you’re not Type A like me this probably seems crazy, but I find that if I’m doubling up my exercise with something else (listening to an audiobook, praying, working on my Scripture memory, mapping out articles in my head, reading a good book I’m reading during my warm-up walk on the treadmill, etc. ), I enjoy it a lot more and it feels like I’m killing two birds with one stone. Try using online trackers such as MyFitnessPal, SparkPeople, or Nike+. All of these have cool features that make logging your exercise time more rewarding. What motivates you? Set some goals and plan some rewards along the way. Maybe you decide to put a quarter in a jar every time you exercise for 25 minutes and then you can use this money on a little special treat (coffee at the coffee shop, a used book from Amazon, etc.) every few weeks. Bedtime: Made it to bed by 9:36 p.m. Woot — I’m slowly making progress in the right direction! Wake Up Time: Got up at 4:55 a.m. this morning! 3. If you already have an exercise plan that you follow each morning, leave a comment telling us about it. If you aren’t currently exercising in the morning, consider if you have a 5 to 15 minute slot you could devote to exercise. Leave a comment telling us if you’re committing to exercise every morning (or evening, if that works better for you). We all have a lot we need to do each day. And, if you’re anything like me, you probably have a whole lot more that you want to do in each day, too. I was just telling my husband yesterday that I have so much that I want to do that it’s a problem. I have a laundry list of new skills I want to learn, things I want to teach my children, place I’d love to visit, subjects I want to research in-depth, projects I want to attempt, people I’d like to reach out to and befriend, ministries I want to support, books I hope to read, character I want to work on… there are so many, many good things in life to choose from that putting together a daily to-do list can seem daunting. But here’s the truth we all have to accept: none of us can do it all. Collectively, we can do a lot with our lives and make a huge impact in this world. Personally, we can make a big difference over the course of our lifetime. But we all only have 24 hours in each day. Our time is limited and our energy is finite. Thus, we have to pick and choose the best from among the good. And we have to realize that what might be the best for others will not necessarily be the best for us. Determining what to put on our daily to-do list begins with deciding upon our own personal priorities for the season of life we’re currently in. I recommend choosing no more than five to six priorities. These are the things you will wrap your life around and what will be the basis for the majority of everything on your to-do list and all of the yearly, monthly, and weekly goals you set for yourself. Before you try to save the world, you need to focus on making sure you (and your family, if you have one) have clean clothes, food to eat, and proper hygiene and rest. You’ll be a lot more effective at your efforts in other spheres of life if you make sure that you take care of the basics first. So, think through what must be done in the course of your day. This is not what would be nice to have done, but those things that are actually necessities. 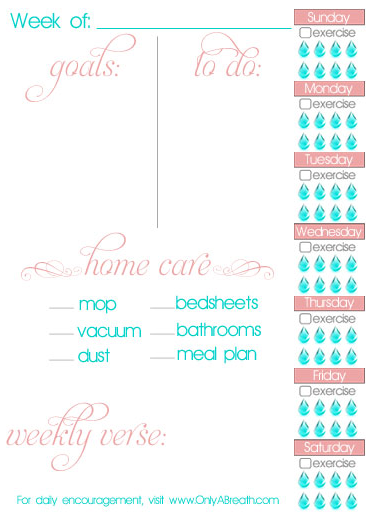 For the record, the list of necessary things that must be done in a day is usually fairly short for most of us. If you’re caring for someone who has life-threatening illness, have a special needs child, or have a lot of little ones, then most of your day is likely going to be made up of basic things. While they might mostly seem menial and mundane, remember that taking care of the basic needs of others is a very important thing to be investing your life in — even though it’s exhausting work. Remind yourself of what would happen if you weren’t doing it and you’ll realize just how important your tasks are! Once you have the basics on your to-do list for the day, if you still have a little wiggle room in your schedule, pick a few bite-sized pieces of your goals to tackle. These will typically be things you can accomplish in 15 or 30 minute slots, so keep this in mind when breaking goals down into bite-sized pieces. If you can’t accomplish the bite-sized piece in 30 minutes or less, it probably needs to be broken down further. I’ve found it helpful to prioritize my to-do list by marking each item with numbers in the order of priority I need to accomplish each task. I don’t always follow it to a tee, since sometimes a block of time will open up during the day and it will be perfect for tackling a specific item on my list — even though it’s out of order. When that happens, I just go with the flow and am happy to have another item crossed off the list, regardless of the fact that it’s out of order. That said, as much as possible, I encourage you to focus on getting the hard tasks done first. “Eat your frogs” early in the day and you’ll have a sense of accomplishment and fulfillment to carry with you the rest of the day! As I’ve talked about before, if you want to set yourself up for success, you need to keep your to-do list short. If you put 56 items on your to-do list at the beginning of the day, you’ll probably give up before you even start because you’ll feel overwhelmed at defeated. It’s better to plan to complete a few things and actually follow through with those things, then to set out to accomplish 102 things and just run around in circles all day trying to start a bunch of different things and finishing nothing at all. 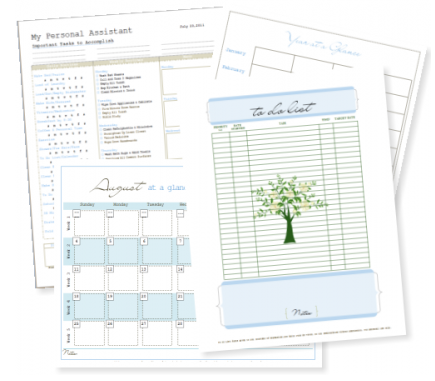 We have a number of free household customizable management planners available to download, including a customizable daily docket. 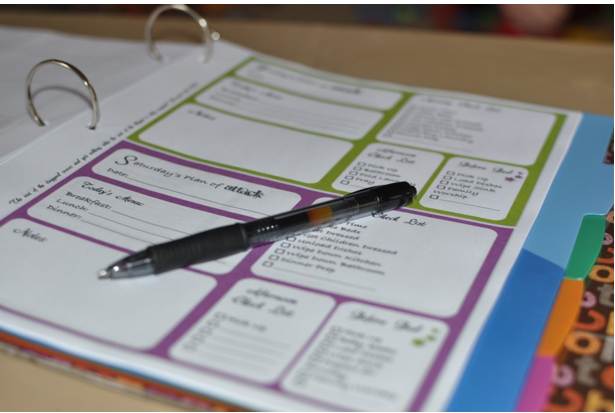 Ann Voskamp has a free Daily Planner available for download. 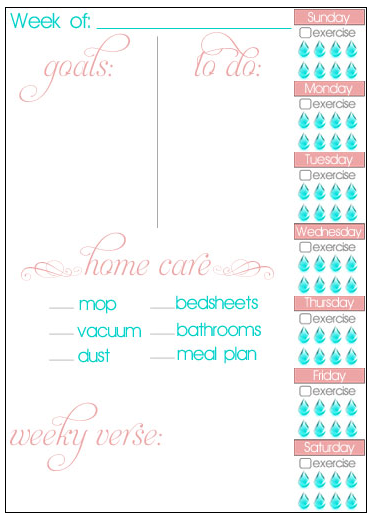 Download and print a free Weekly Household Planner and Goal Sheet from Only a Breath. Bedtime: Made it to bed by 9:38 p.m. Woot — I’m slowly making progress in the right direction! Wake Up Time: Got up at 5:04 a.m. this morning! 3. If you haven’t done so already, pick 1-5 goals that you’d like to accomplish in the next year and break them down into monthly and weekly pieces, if possible. 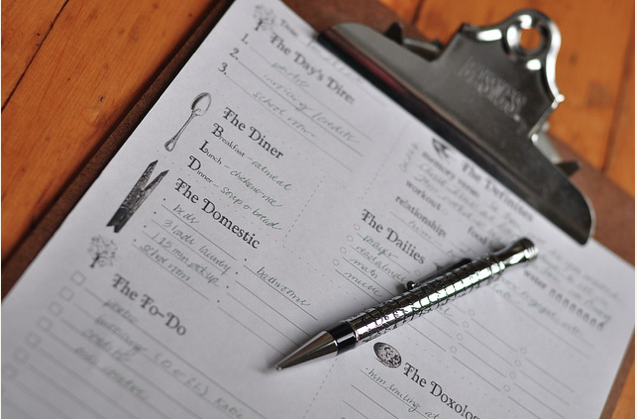 Start looking for opportunities to add in bite-sized pieces to your daily to-do lists, as you’re able. Let us know what these goals are in the comments section.